Saturday's 3-0 win over Israel was a great day for me and for England. Any time you score for England is going to be special but to get my first goal at Wembley in front of 85,000 people in such an important Euro 2008 qualifier really made it something to remember. My celebration was me saying "Richards. Remember the name" - because if you didn't know it before, then now you do! 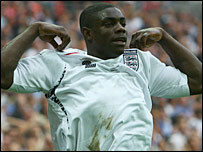 I had told people that if I scored for England I would do that, so I had to stick to my word. Rio Ferdinand came running over to join me while I was celebrating and he just said: "Brush your shoulders off." It is a bit of a young man's saying and I don't know whether many people will be familiar with it - but in other words it just means well done. After the game England coach Steve McClaren was very pleased and he told me "you deserve it". He said that my work rate was good and that he hopes there are many more goals to come. My Dad is still in Africa but he watched the game and when I spoke to him he was pretty happy too - understandably! He had actually told me that I was going to score some time soon for England so I am glad he was right. When I picked up my phone after the game I had 153 texts waiting for me - a lot of people wanted to congratulate me. It has got to have been one of the best days of my life but everyone is going to expect me to score every game now though! 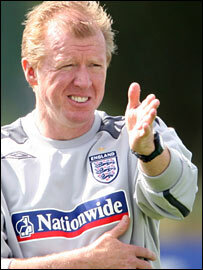 Steve McClaren has talked about how quickly I have adjusted to international football. But I have never had any nerves because, the way I saw it, I play in the Premier League week-in, week-out and I thought I had been as good as some of the players I played against that had been in the England squad. For me, I am not just here or playing because someone is injured, I am here to make a mark on the team and that is what I am trying to do. When Gary Neville is fit again, it is down to the manager who plays but I think I have done well enough to keep my place. However, there are going to be some games against certain teams where Gary is fit and England need some experienced heads. But also there are going to be times where the team needs some energy and pace so who plays could even come down to who the opposition are. I was delighted with my performance on Saturday but I was very happy for Shaun Wright-Phillips too after the stick he has had in the last couple of years. He was the best player on the pitch against Israel by a mile and I hope we can link up just as well against Russia on Wednesday. For both of us to be boys from the Manchester City academy and playing for England is nice as well and I really enjoyed our partnership at Wembley. Shaun is an out-and-out winger now but in his City days he used to play wing-back so he knows how to tackle as well and he gave me a bit of licence to get forward. We only ever played a pre-season game together for City but from training together we knew a bit about each other. I know what his strengths are and it was just good to be out there with him. Steve McClaren told myself and Ashley Cole that we would have to join the attacks as much as possible. Israel were expected to put 11 men behind the ball so we would have to help out. To be fair to Israel, they did try to hit us on the counter-attack, they didn't just put men behind the ball, and Ash and I both had to make recovery tackles as well. I did notice the boos on Saturday but I did not realise they were booing David Bentley. It was only after the game that one of the guys mentioned it. It is obviously not nice when your own fans boo you but I know he can take it and I don't think it will happen again. Hopefully the fans will realise he made a decision not to play for the England Under-21s over the summer, accept it, and leave him to get on with playing for England - hopefully many times. David is a confident kind of guy who takes things as they come and I am sure he will show his critics what he can do. Steve McClaren has had some criticism too but as England manager he expects it. But the England players are not only playing for themselves, we are playing for the whole team and that includes the manager and the fans. We are all in it together, when the manager get criticised, we all get criticised. But after Saturday's performance there have been no complaints and hopefully we can take that into Wednesday and shut up a few more people. Like I told you last week, Saturday was a must-win game - and so is this one. It will be a totally different game to Israel. We are expecting Russia to come out at us a little bit more. But if they do, that leaves gaps for us to attack them and we will be looking to dominate them in the same way as we did Israel. Confidence is sky-high but the one thing we cannot get is complacent. We have got to take the same mentality we took into Saturday's game and crack on. There will be no fear from us. We will try to concentrate more on our game than on theirs and try to keep putting them under pressure. We have had a meeting about complacency and about how, if we want to get to the Euro 2008 finals, we are going to have to get used to winning games on a back-to-back basis - and this is the time to do it. A few of you have asked me about my physique and whether I worked out a lot when I was younger. You might not believe me but I actually did nothing - I think my physique was just passed down to me. I have always been doing sports like football and rugby but I never did any specialist circuit training or anything like that. You also wanted to know if there were any other Richards coming through the ranks at City or anywhere else. I have got two brothers but neither of them are footballers. My older brother is called Marlon and he used to play. He was quick as well. He also used to be into his dancing - he danced for Spice Girl Mel B when he was younger - but he didn't take up that career in the end either, he did not really like it. I have got a younger brother too. Again he is quick and he ran for his school but he broke his leg playing football and he has no interest in it anymore.